UPDATED: Tue., April 10, 2018, 3:13 p.m. The first six months – and 2,442 games – of the NBA’s regular season weren’t enough to complete its playoff picture. 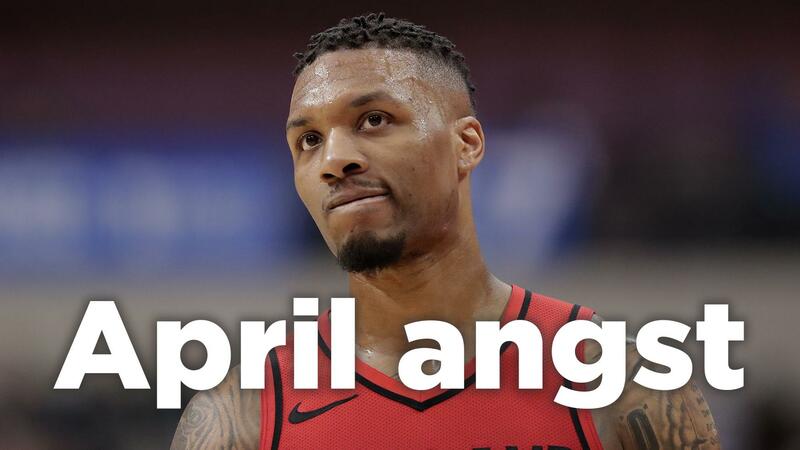 In fact, it is going to take until the final buzzer of the season’s 2,460th and final game Wednesday night – the Portland Trail Blazers hosting the Utah Jazz – to determine exactly how the postseason will shake out. It is a fitting conclusion to what has been preposterously close races in both conferences over the past few months. The drama predominantly rests out West, beginning with the showdown between the Denver Nuggets and Minnesota Timberwolves in Minneapolis Wednesday night for the final unclaimed playoff spot in either conference. With identical 46-35 records, the game boils down to a simple equation: winner goes to the postseason, loser goes home for the summer. For a pair of franchises hoping to break long playoff droughts – four years for Denver, and a stunning 13 years for Minnesota – the stakes couldn’t be higher. It’s a small dose of March Madness in mid-April – the kind of winner-takes-all matchup that is supposed to be confined to the college game. If that was all the NBA had to focus on for the next two days, that would be enough. Instead, the entire playoff picture in both conferences still has to sort itself out over the final 18 games of the regular season. Only five teams – the Toronto Raptors, Boston Celtics and Indiana Pacers in the East, and the Houston Rockets and Golden State Warriors in the West – know their seeds as of Tuesday morning; the Raptors, Celtics and Pacers are locked into the first, second and fifth spots in the East; the Rockets and Warriors will be the top two seeds in the West. After that? Well, that’s anyone’s guess. We’ll start in the East, where the Philadelphia 76ers have the inside track to the third seed ahead of the Cleveland Cavaliers, thanks to Philadelphia’s thrilling victory Friday at home over Cleveland. With wins in their final two games – at Atlanta, and home against the Milwaukee Bucks – the Sixers will clinch the third seed, and will install themselves as the favorites to make the Eastern Conference finals. Lose either one, and the Cavaliers – who play the hapless New York Knicks on Wednesday in Cleveland – can claim the seed. Whoever finishes fourth will host Indiana in the first round. The bottom of the East, however, remains up for grabs. A win for Milwaukee coupled with a loss for the Miami Heat on Monday night saw the Bucks move past the Heat and into sixth place. Another win Wednesday over Philadelphia would lock the Bucks into sixth. A loss, however, could see Milwaukee fall as far as eighth, depending on what Miami and the Washington Wizards do. The Heat host the Raptors – who will likely be resting players – Wednesday, while the Wizards host the injury-riddled Celtics at home Tuesday before ending the season in Orlando on Wednesday. If all three teams tie with 44 wins – a likely scenario – then Miami would get the sixth seed, Washington would get seventh and Milwaukee would be in eighth. If it plays out that way, the Wizards will be thrilled, as it would mean facing the battered Celtics instead of either the Raptors, Sixers or Cavs in the first round. Think that was complicated? It’s got nothing on the state of play in the West, where advanced mathematical degrees are necessary to figure out the various tiebreaker scenarios for the final six playoff spots. It’s virtually impossible to lay out all of the various scenarios in way that will make sense; instead, let’s map out the games to watch over the final two days of the regular season. Of the 18 games remaining, five – Golden State at Utah, Denver at Minnesota, San Antonio at New Orleans, Memphis at Oklahoma City and Utah at Portland – will have a direct impact on the final playoff picture. First up is Warriors-Jazz Tuesday night, where a victory for Utah would turn the game against Portland into a battle for third in the West. A loss, though, would guarantee third for the Trail Blazers. The Oklahoma City Thunder, meanwhile, clinched a playoff spot with a win in Miami on Monday. A victory Wednesday at home against the tanking Memphis Grizzlies would ensure the Thunder finish sixth or better – thus avoiding facing either the Rockets or Warriors in Round 1. Whether they finish fourth, fifth or sixth depends on what happens with the Blazers and Jazz. That leaves the remaining two games – Denver at Minnesota, and San Antonio at New Orleans – to determine the rest of the West’s playoff picture. If Denver makes the playoffs, it will play Golden State, as the Nuggets would be tied with the loser of the Spurs-Pelicans game, and holds the tiebreaker over both of them. If Minnesota wins, though, then it would finish eighth if San Antonio loses, and would finish seven if New Orleans does. One would think that over the course of 2,442 games, all of this would have sorted itself out. Instead, the final two days of the regular season will be a frantic free-for-all to figure who will be left standing when the postseason begins Saturday afternoon. Published: April 10, 2018, 9:26 a.m. Updated: April 10, 2018, 3:13 p.m.